Learn how to set a Max Listed Quantity for your eBay and Amazon listings to create the appearance of scarcity, stay below listing limits. Max Listed Quantity is a setting available for eBay and Amazon that allows you to control how much inventory Zentail tells these channels you have. Your eBay selling limits would prevent you from listing more of your catalog since listing value is determined by Item Price x aggregate units of inventory across all listings. You want to create the appearance of scarcity. You don't want competitors to know how much inventory you actually have. Once your Max Listed Quantity is set for eBay and/or Amazon, the quantity on the channel will always show the lesser between that limit and your actual inventory. Scroll down to the Amazon and eBay cards on the left sidebar and click on Advanced Options. In the Maximum Listed Quantity field, enter the number of units you want to send to the channel. If you would like to immediately update the listing, click Update & Push. Go to the eBay card on your Integrations page. Enter the desired number into the Max Listed Quantity field, click Save Settings. 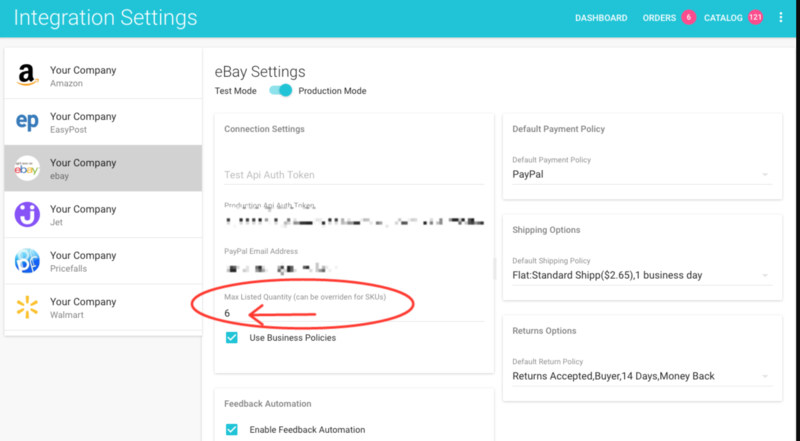 Note: If you have a maximum listed quantity set at the SKU level, this value overrides the value set on the eBay integrations page.